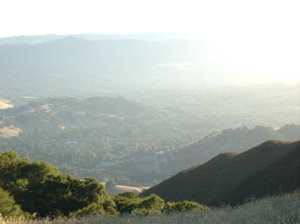 View from a ridge in Mount Diablo State Park in California. The recognition of the limitations in our knowledge is essential in gaining wisdom. This recognition is the deciding factor between growing old, bitter and stubborn or becoming brilliant and wise in our later years. Gaining wisdom with age is not a given. It comes with open-mindedness and a willingness to examine our own ignorance. To be truly inspired is to be willing to doubt the things that you think you know and to listen to ideas with which you may at first disagree. The one consistent change that occurs in my life as I gain years is that the older I get, the clearer my ignorance becomes. Like most people, as a teenager, I thought I knew everything. As a result, I rarely asked for help and I made a lot of silly mistakes. As I’ve gained experience in life and have attempted to understand the grand questions: the meaning of life, who is God, why do I exist, etc., I realize more and more each day just how much I don’t know. This realization has been the key to wisdom and inspiration as it makes me teachable, allows me to ask questions of others and God, and is absolutely essential for any meaningful change in my life. And, it is the key to meditation. One very effective method of meditation is to observe silence while clearing your mind of all things you know or believe to be true. Recognize your thoughts of good and evil, right and wrong, what you believe about God, why you are here, why the world exists. One-by-one, let go of those thoughts and realize that as an individual human being, you could not possibly know any of these things with absolute certainty. Allow yourself to see God with a clarity that you may have never experienced before. Today, second guess something that you believe you know to be true. Ask what other people believe about that idea. Then, ask God for clarification and take time to silently meditate on that belief. You may find that you will gain a new and refreshing view or you may further solidify your belief. Either way, wisdom and humility will be gained.